If you are visiting us for the first time, Welcome! The Wine Spies feature one exceptional wine each day – and we only bring you wines that we ourselves seek out and love. Always, the wines are great. Sometimes greater than great, as is the case with today’s wine from Sort This Out Cellars. Backgrounder: Lake County, often overlooked, is just north of Napa County and has been producing excellent fruit since the early 19th century. Currently, there are nearly 9000 acres of vines in the county of which Cabernet Sauvignon is the largest share. The diverse Terroir is buffered by one of the largest natural lakes in California, Clear Lake. Before Prohibition, Lake County was the largest grape producing regions in all of California. Look – Dark purple with slow thick legs indicating a slightly more viscous wine. Smell – Give this wine time to open up and it will reveal an initially slightly sweet bouquet of dark fruit, blackberries, tobacco and dark chocolate. Feel – This wine is medium-bodied and dry with solid tannic structure that softens as it breathes. Taste – Nice fruit with ripe cherries and raspberries, black pepper, cigar tobacco and a hint of licorice and spice. The flavors in the wine evolve and continue to expose themselves as you enjoy it. Finish – This wine finishes medium long slightly dry leaving you with the flavors of fruit, spice and tobacco. Conclusion – This is an interesting wine, its big and bold with solid fruit and tannic structure but also has some very interesting flavors, some subtle, some not so subtle. This is the type of Cabernet that you can pair with bold foods or enjoy with a great Cuban cigar, or even just relaxing after the drive home from Vegas! Real spies play Baccarat? Well, not this one, I prefer Craps, and although I play a relatively conservative game covering my numbers with max odds, I’ve been know to throw a few hardway bets on the table. Don’t report this to HQ, but while gambling, I prefer a good scotch, nothing less that 12 years old, and Cuban cigar (Montecristo #2 if you want to get me a gift) – rarely opting for wine while on the casino floor. While covering my bets with odds, two younger gentlemen (generously speaking – these guys looked as if they just rolled into town) walked up to the table, took the spots just to the right of me and threw down a fat wad of cash. The table was cold, but I decided to stick it out until my time to come out. Didn’t need to wait that long, the first throw from the suspicious gentlemen hit 7! The second roll a 4. I placed my odds, a come line bet and tossed a few bucks on a ‘hard 4’. After a few rolls, hitting the numbers, he rolled a hard four. The table erupted, high fives a plenty. It was just then, that I noticed the guys drinking wine. Odd I thought, but, then and perhaps it was the scotch, without regard to blowing my cover, I introduced myself. 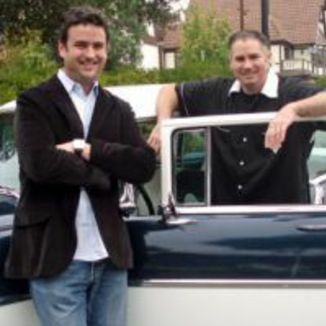 It turns out that these guys, Jeff and Mike, were the founders and winemakers for Sort This Out Cellars on a road trip to the famed Sin City. After a night of big wins, a few losses and plenty to drink, I got the whole story of their newly founded winery. And after tasting the Hardways Cabernet, I had to spy out a few bottles for our fellow operatives. Cheers to Lady Luck, always keeping her watchful eyes over us all! The Lake County Region can be seen in this satellite photo. We roll into the Stardust on a hot Thursday night in July ‘97. No rooms yet….no plans….and no luggage other than a suitcase of beer. We immediately take to the craps table and things started out cold. “Can we get a drink here?” someone asked. “Cocktails!” the boxman shouts out and a thin older woman with bottle blond hair and a raspy voice walks over. We ask for a couple drinks and she returns just in time to watch me roll a four. “Four, easy four!” the stick man yelled. The cocktail waitress hands us our drinks with not so much as a glance from her tray. She says, in the rough tone that only a woman with thirty years of hard casino time under her belt has, “Boys, sack up, back up your odds and cover the hardways, remember, you’re here to play the dice not the money.” Two rolls later “Hard four, pay the line!” the stick man called. Hardways Cabernet Sauvignon pays tribute to everyone who takes a chance and goes against the odds, coming out the big winner because they blurred the line between luck and skill. With rich bold flavors of boysenberry and Bing cherry, alongside a touch of cocoa powder and sweet tobacco, this medium-bodied wine finishes like an endless night in Sin City. With our motto Good Times……Great Wines, we founded Sort This Out Cellars as a reflection of our humor, passion and palate. Our intention is to bring together our experiences, interests and excitement for life to the bottle. We produce wine in Templeton, California, with a dedication to sourcing grapes and blending wines that are representative of the diverse character of California’s vast wine country. 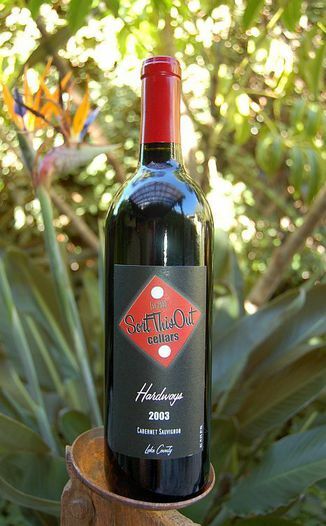 With our focus on small production unique wines and wine blends, October ’07 marked our inaugural release with Hardways Cabernet Sauvignon and Money Plays Merlot. They are the first in a limited production series of wines named for the bettor’s action, reminiscent of the risk and luck that is so much a part of the business of making wine. The Sort This Out Cellars name is partially taken from a favorite line in the 2001 comedy Made. Our label design was inspired by the fun and nostalgia of old time Vegas. It wasn’t our goal to make “Las Vegas” wines but rather to explore the sense of excitement and energy that sprang from classic Vegas.